High temperature occasioned by the tropical sun in Nigeria is not a new experience. However, coupled with the realities of climate change and the prevailing economic situation in the country, many are coming face to face with the harshness of the sun for the first time. The rains have tarried in coming along this year. And the challenges being faced in the country’s power sector have ruled out air conditioners as an alternative for many individuals, even corporate organisations. The fuel scarcity that has lingered for more than a month now has also forced many to stay longer in the sun. Though, the human body adapts accordingly and as seamlessly as possible, many have suffered the consequences of the extreme temperature. The consequence for some has been mere heat exhaustion which can quickly be battled with drinks of cold water and a rest in a cool environment. Meanwhile, for some it has been heat stroke, which is more severe and requires medical attention. Drinking water helps to hydrate and replenish your body. When the temperature is high, the body automatically reacts by sweating. That may be the body’s way of cooling the temperature but it is also losing water. 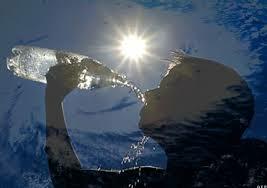 Extreme dehydration may make the body weak and it may lead to dizziness and fainting. So you need to drink water. Showering will help cool the body temperature naturally. It will also help curbing issues with body odour that may be occasioned by heavy sweating. The National Sleep Foundation recommended placing a damp washcloth in the freezer to create an easy, cooling compress, reports accuweather.com. Placing the frozen cloth on your wrists or any pulse points will bring an icy shock to your body. If you do not have an ice pack, leave your wrists under cold, running water for 30 seconds. This will cool the blood in your veins and provide some instant relief. As much as cold bottles of beer or energy drinks may look appealing in the hot sun, it would be a bad idea to take these substances as they act as diuretics and promote dehydration. Try to visit public buildings with air conditioning during the hottest hours of the day if the heat becomes unbearable, counsels medicinenet.com. Libraries, shopping malls, and movie theaters can all be good places to cool down. Wear loose-fitting, lightweight, light-coloured clothing, says the American Red Cross society. Avoid dark colors because they absorb the sun’s rays. If you can, stay indoors and avoid strenuous exercise during the hottest part of the day. Never leave children, pets in the car, the inside temperature of the car can quickly reach 120 degrees. Don’t eat large protein-rich meals that can increase metabolic heat and warm the body. Incandescent light bulbs can generate unnecessary heat, as can computers or appliances left running. Eat fresh foods that do not require you to use the oven or stove to prepare.